Learning design is always a challenging undertaking. The growing trend towards informal, just-in-time, and pull (versus push) approaches to learning present new and greater challenges for learning designers. We must now create engaging environments where learners can immerse themselves in exploring and creating content in a manner which enables them to solve their authentic, real world problems. Metaphors can help us to clarify our thinking in terms of learning design. Here is one I use when considering how a purpose-built learning environment can support the key characteristics of informal learning. The metaphor is that of a ‘home’. 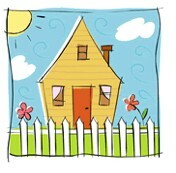 A home is a central part of our everyday lives (just like learning). It is one of the places we go to for specific purposes. In the home are a variety of individuals who whilst having strong connections, also have strong individual interests, traits and values. The individuals both develop within, and bring to, the home the knowledge, skills and attitudes that they have developed over their lifetime. A home consists of a structure of various rooms and spaces which people move between, depending on their purpose at the time. The dining room is a place for community, discussion and debate; the kitchen is a place of creativity, of making something (individually or collaboratively), of trial and error; the living room is where we access new ideas and information through mediums such as TV, books, internet, etc; the bedroom is a private space for personal reflection and rest; and so on. The yard links us to the real world - to our wider community and to new potential community members. Some activities are structured, such as meal-time, study-time and recreation-time, others are determined by the individual’s preferences. The design of the house – walls, doors, stairs, open spaces – provides the links between the different activities within. In the home, the individuals are (largely) able to control their movements and approach different activities in their own unique way. The structure of the house – although not top of mind - support the individual’s endeavours. Using this metaphor to think through informal learning design, I want to create an environment where individuals have access to curated content which they can explore, experiment with, and reflect upon. I want to create an environment where individuals can come together, driven by a common interest (the content), and co-create content which is then shared within the environment. I want to create a structure for this environment which supports these activities, but which is unobtrusive. And I want to provide an environment which is nurturing, to support development both individually and in the collective community. Wow Shelly, that sounds like an amazing program. What a great way to handle such a delicate topic! Anne-Marie works with organisations across the association, not-for-profit, university and college sectors on projects encompassing strategy, design, delivery and management of adult education.